A Steam Group hopes using politeness and respect will encourage Valve to speak up about Half-Life. Over 10,000 gamers have joined a new Steam Group that's looking for Valve to be more outgoing about the next step for its award winning (but dormant) series. The group, titled A Call for Communication (Half-Life) is hoping that by keeping its message simple, respectful and non-confrontational, it will be able grab Valve's attention better than using a campaign of anger and negativity. "We have decided to gain Valve's attention by delivering a basic message," the group stated in their open letter to the Bellevue, Washington-based company. "Your oldest and longest running fanbase would like better communication. 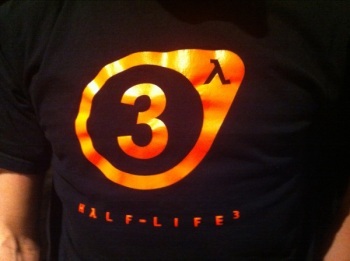 The group was founded on December 25th, 2011, most likely out of disappointment that Valve didn't deliver any news about the return of Gordon Freeman as a Christmas present. "Waiting patiently for over four years is a daunting task, especially when E3 comes and goes without any beat of a Half-Life pulse," the group continued. "Valve had stated that information was scheduled to be released towards the end of 2008, and we believe that if they have chosen, for whatever reason, to withhold this information, fans should at least be acknowledged in some way." Valve hasn't exactly been slacking off in the years since Half-Life: Episode 2. Since the game's launch in October 2007, it produced Left 4 Dead and the game's sequel, released numerous updates to the award-winning multiplayer shooter Team Fortress 2, and most recently Portal 2. Dota 2 and a new Counter-Strike title are also in the works, although some of these game projects were originally in development by teams that Valve acquired over the years. If you agree with the group's sentiment, you can join up via Steam.